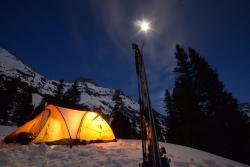 Picture: Camp for extreme skiing expedition in the Rocky Mountains. Please note: Seats are first come, first served. Preview Episode 1 at the screening: The Rockies stretch 3000 miles and is one of the great mountain ranges of the world. It is home to cougar, wolverine, wolves, and grizzly. Daredevil wingsuit fliers jump from high peaks and Native Americans compete in breakneck horse races. See more preview clips here. Jim Ellis has traveled extensively. He has worked part time for Pack Paddle Ski Corporation since 1988. In addition to local trips he has been to Alaska five times, Peru (Andes) three times, Iceland, Ireland, parts of the AT, Nova Scotia, and the Rockies in Wyoming. Personal travel includes Austria, Switzerland, Canada, and great deal of backpacking in the U.S. Rockies including Colorado, Idaho, Wyoming, New Mexico, and Utah. Jim is an avid white water kayaker, skier, and photographer. Jim has worked for the past 26 years for the Avon Central School District. Five years as a teacher and twenty-one as the Technology Director. Jim is also co-owner of a technology installation company called The SmartGuys. Steven French - Steven has led many trips and traveled extensively in many countries, including the three regions featured in the film series. He has led trips through Pack Paddle Ski and also on his own. A few places Steven has been: Mongolia, Africa, Nepal, Nicaragua, Romania, Alaska, and he has climbed Kilimanjaro three times. Steve Cudzilo – Educator from Hilton Central Schools - Traveled to Quebec City 7 times, Washington DC 3 times and Boston once. He has been to Hawaii and toured the Volcano National Park as well. Steve took a biology/geology course on San Salvador Island Bahamas through SUNY Brockport and have been to Jamaica. As a professional, Steve is National Board certified and a NYS Master Teacher. Steve has been teaching earth science for 20 years, the past 18 being at Merton Williams Middle School in Hilton. Steve has taken around 40 professional development courses in his years in Hilton and is in the final stages of attaining his administrative certification. Steve will have 66 graduate credits when that is complete. Last year, Steve, was one of 200 teachers worldwide chosen to spend a week at the US Rocket and Space Center's Space Camp for Educators for a week. Steve is a lifelong learner and always looking for ways to expand his horizon, meet new people and learn new things. Joann Morreale - She is a retired teacher, who taught for 31 years in the Rochester City School District. Upon retiring from RCSD, she worked for nine years with aspiring Science Educators and practicing Science Educators at the University of Rochester’s Warner School of Education. She has always have been in awe of the natural world and its inhabitants, and is getting ready for an 11 exploration of the Galapagos Islands. An avid reader, and, in preparation for the Galapagos, she is re-reading Darwin’s The Origin of Species and The Voyage of the Beagle. Joann is also a past owner/operator of the Cinema Theater. The Rockies on July 11 - The Rockies stretch 3000 miles and is one of the great mountain ranges of the world. It is home to cougar, wolverine, wolves, and grizzly. Daredevil wingsuit fliers jump from high peaks and Native Americans compete in breakneck horse races. The Himalayas on July 18 - The extraordinary wildlife and people of the Himalayas – the highest mountain range on earth. Bizarre snub-nosed monkeys live in frozen forests. Tibetan monks perform ancient rituals high in the mountains whilst snow leopards prowl the mountain sides. The Andes on July 25 - The extraordinary wildlife and people of the Andes. Pumas hunt guanaco, shape-shifting frogs hide in remote cloud forests and the descendants of Inca build bridges of grass. The world’s driest desert, huge salt lakes and spectacular peaks are all found in the world’s longest mountain range.